Time to trade your Berretta in. Looks like Sig won the big contract. So how do we accurize these pistols? Re: What's a Sig P320? Wow, I thought it would be the Glock 19 for sure. The 320 is a really next-gen design though, the metal chassis is the legal gun, everything else is interchangeable. Points well, great trigger, easy to handle. Guess the AMU shop will be figuring out how to make them shoot small groups... and everyone else will follow. "To that end, I fired 12 groups from Roy’s gun at fifty yards off bags today, using both 115 and 124 grain Hornady XTP’s. Interestingly, Roy’s pistol consistently dumps the first manually cycled round WAY low and right, about 5″ out of the core group. This indicates some lockup and slide to frame fit issues we’ll deal with when we build these up. Excluding those first-round flyers, the worst group I got was also my first, at 3.8″. Once I changed glasses and settled down behind the gun, everything started to fall in. The best group was my last, and ran just under 2.4″ for all six rounds. The average was about 3″. That’s for a mechanically stock P320 with substantial rattle in the slide fit and lockup. I can’t wait to see what these will do once fitted properly." Where do you attach the dummy cord? I dryfired one and I was impressed by the trigger (for a polymer pistol). It had a clean break, unlike a glock where it feels like you're compressing a sponge. As part of the new handgun procurement, there were talks of the army adopting a new more powerful pistol round. Anyone know if they are sticking with 9mm or going to a different caliber? the point of changing the army sidearm was for modular. so it will probably be available in all calibers. According to the report, the modularity will allow the same framework to be configure from anything from a 9mm 6 inch target pistol to a 3 inch 45 concealed carry pistol. SIG SAUER sells conversion kits for the 320 in 357 Sig and 40 S&W. I was hoping they'd offer 45ACP also but I don't think that will be in the cards. "You must purchase a 320 chambered in 45 first and then you can purchase any of the conversion kits available to convert it (say to 9mm). " So, entry into bullseye shooting and service pistol with a .45ACP P320 with a 9mm and .22lr conversion kit. Slartybartfast wrote: So, entry into bullseye shooting and service pistol with a .45ACP P320 with a 9mm and .22lr conversion kit. I'd prefer 32acp. With reloads, 9mm has similar recoil to a 45, and 45 seems more accurate? Bigger issue to me is the trigger. I can live with 2.5 lbs for RF and CF, but not 3.5. Also, since the 320 is striker fired, I it possible to get a truly "great" trigger with it?? The best 1911 trigger I have ever fired isn't really all that close to a good 2 stage trigger. This is, of course, based on personal observation. "One of the major goals of the effort was to adopt a pistol chambered for a more potent round than the current 9mm." I'm wondering what caliber it will end up with. Since its modular, probably start with the 9mm to use up the stockpiles. Perhaps I am reading the article incorrectly but the guns America review says that the 45 is not interchangeable with the 9 mm? Sig web site seems to confirm. The 9mm will convert to 357 or 40. The 45 is 45 onLy, although frame size etc can be changed. Too bad. Reports have also said that the 320 and 250 have considerable interchangeability. From what I recall I can get caliber conversion kits for my 45 (p 250) to make it a 9, .357 or .40 but the opposite is not true. The 9 frames are not wide enough to fit .45. So .45 can become a 9 but 9 can not become a .45 even though the conversions use standard magazines. Clear as mud? The whole plastic frame can be swapped. The serial numbered receiver fits in the plastic frame. To swap to .45, to need a larger plastic frame to accommodate the bigger mags needed. If you're swapping between 9mm, .40, .357sig, soy can use the same small frame since the mags are the same width and length. If you buy a .45 version and want to swap down to one of the small frame calibers, you'll have to buy a small frame and swap the internal receiver into it. I find it interesting that it has the ability to mount a reflex style red dot. 9146gt wrote: I find it interesting that it has the ability to mount a reflex style red dot. The P320RX version has this capability. I have not been able to verify that the Army adopted this version of the P320. But if they did, that would bring red dots to service pistol. I think this gun with a little bit of rework in the barrel and trigger would probably shoot superb groups at 50 yards, just like the XDM 5.25 does. I guess I should have waited on that purchase . 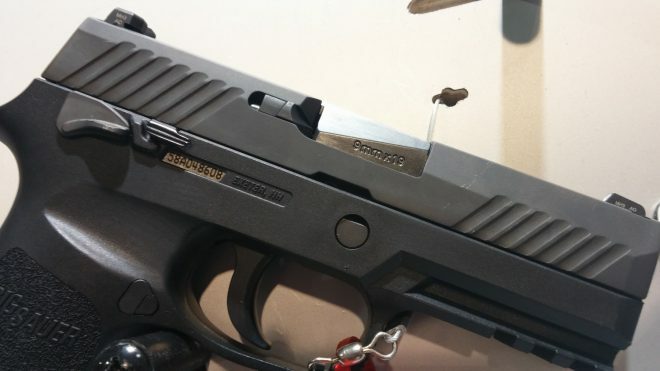 Also, if the P320 can shoot, then it bodes well for the P210 that will soon be released. A local guy mentioned that the new P210 had a freakishly nice trigger (might be too light for service pistol) as well as a nice overall feel. Who knows, it could be good but many won't like the redesigned breech lock vs browning lock up change, which does effectively make it a different pistol. Here is another video that talks more about both the P210 and the 320 series. The pistol you describe is the P320 X5, I doubt the Army adopted Sigs most tricked out P320. But there are other versions of the P320 with optic capabilities and maybe the Army did adopt an optic capable P320. I'm sure we will all find out soon. It looks like these are the official configuration for the MHS. Straight from the horse's mouth. Built in red dot compatibility. Might come in handy for centerfire and service pistol!